Maybe the most important stat during Spring Training is playing time. The positions that a player plays, the amount of playing time the players receive and when that playing time is logged, gives us some insight into what Joe Maddon is thinking as we head towards the regular season. 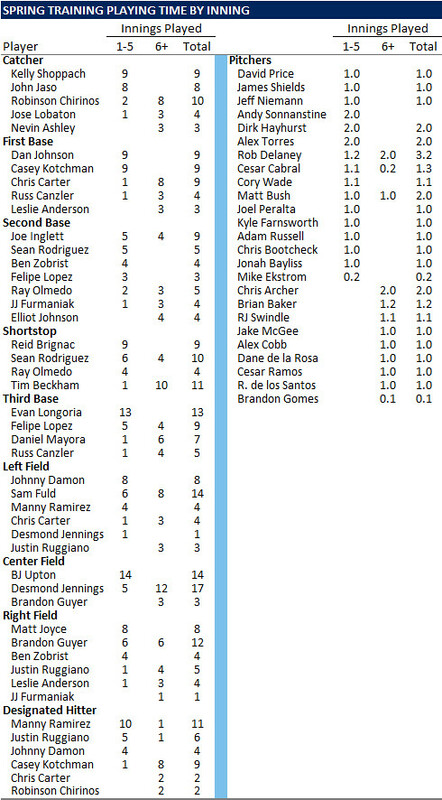 Below is a look at all the playing time that has been logged by the Rays during the first four games of Spring Training. We will update this list every few days. Robinson Chirinos has logged a lot of innings so far (12) but only two of those innings have come early. So thoughts of Chirinos competing for a big league job or forcing the Rays to trade Kelly Shoppach may be premature. There is a good chance that Dan Johnson and Casey Kotchman are fighting for one roster spot. And right now it looks like they are going to get equal looks early in the game. Felipe Lopez is getting a lot of innings early, but most are at third base. Joe Inglett is getting more at 2B, and Elliot Johnson has received very little playing time so far. Is Johnson now on the outside looking in since the signings of Lopez and Inglett? Or is Maddon just giving Inglett an early look before moving back to Johnson? If the latter, that is a dangerous game to play with a player without much big league experience. Not surprisingly, Sam Fuld looks like the fourth outfielder. But interestingly, Brandon Guyer is getting a long look. Most relievers have only made one appearance so we can’t draw any conclusions yet. Still, we were a little surprised that Jake McGee’s first appearance came against minor leaguers late in the game, while 11 other relievers have seen time in the first 5 innings of a game. Big fan of this table. The Inglett playing time is the most surprising thing for me. I would not have predicted that. It's fun to have all these spots up for grabs, but I hope it doesn't dictate a slow start to the year for guys who aren't getting as many reps. This is good stuff, Cork! Thanks for sharing! And good point on Chirinos. It definitely looks like their slow-playing him right now -- but, granted, but the end of the spring, things could look very different. This spring training is really fun to watch this year. Can anyone answer a question for me though? Why is Wade Davis pitching in relief and why did Sonny start yesterday? Sonny only started because Hellickson is having hamstring issues. Davis is on a specific schedule that will lead him into starting game 4 of the regular season. What's important is that he was in to face the opposing teams starters, not whether he was starting or relieving. If this were the latter half of March and he's still relieving then I'd be concerned. Last year the first cuts came on March 11. But this season starts a week earlier, so we could see something by the end of this week or early next week. Of course, they could be giving playing time to some likely to go in the first cut -- knowing they aren't likely to be around beyond next week Maddon wants to see what they've got to offer early on. Cork, EJ is out for a few days with a tight left quad. I was just reading that. Probably explains why he hasn't played much yet. But it is worrisome. Let's hope this isn't one of those where they say a few days but it ends up being 10 days or even longer. All of the sudden he hasn't had much time to get ready for the season and he has to start the year in AAA by default.